Massachusetts is experiencing the opioid epidemic at a much higher rate than the rest of US. In 2014, Massachusetts’s age adjusted overdose death rate was 23.3 per 100,000 which is more than doubled the national rate of 9.6 per 100,0003. In 2017, there were 932 confirmed opioid related deaths in Massachusetts; 76% of deaths were male and 24% were female.4The opioid epidemic also affects the white non-Hispanic population at a much higher rate than any other race. 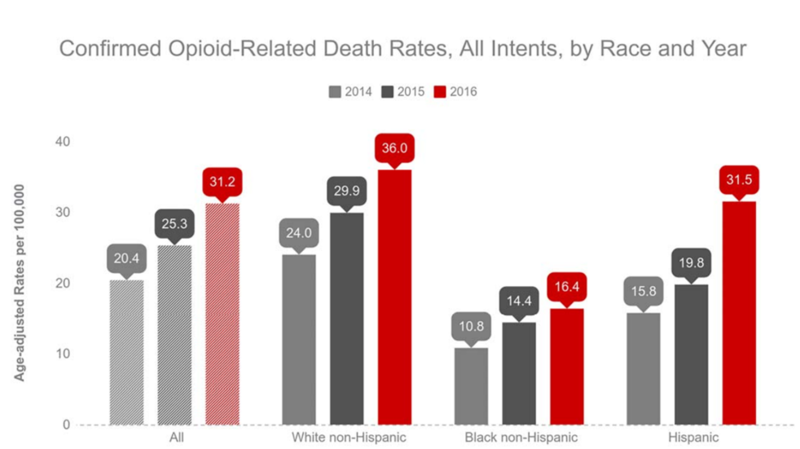 Of the 932 confirmed opioid-related deaths in 2017, 81% or 753 of those deaths were of people of white non-Hispanic race/ethnicity. This group has historically had higher death rates than any other race/ethnic group in the past three years4, see graph below. At a county level, certain counties are experiencing higher opioid overdose death rates than other ones. 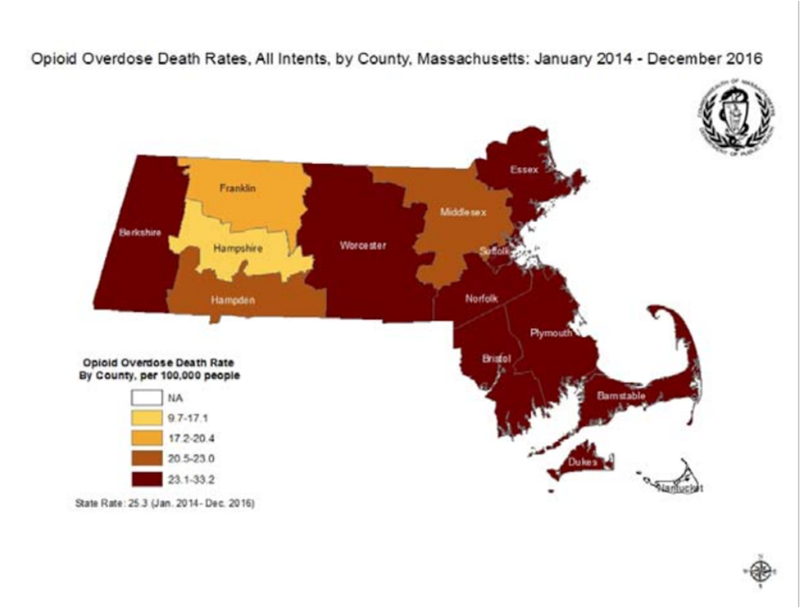 Barnstable, Berkshire, Bristol, Duke, Essex, Norfolk, Plymouth, and Worcester counties currently have the highest opioid overdose death rate,5 see map below. The Center for Disease Control and Prevention (CDC) awarded $28.6 million in funds to 44 states and the District of Columbia to help strengthen prevention efforts and better understand the epidemic through public health data6, which aligns with part of the HHS five point strategy. At ICH, we work on several projects that focus on the opioid substance use disorders. SUSTAIN Communities Evaluation is an initiative funded by the GE Foundation with support from Partners HealthCare. SUSTAIN Communities provide grants and technical assistance to community health centers to build capacity for Medication Assisted Treatment (MAT) for patients with opioid use disorder. ICH Assistant Director of Research, Leah Zallman, MD, MPH, works on a project funded by a small foundation (McManus) that uses electronic health record data to understand the relationship between opioid prescriptions and the development of opioid abuse disorder. ICH is looking into Cambridge Health Alliance data among patients who have ever been prescribed opioids and tracking how many developed opioid use disorders, how long it took, and what are the clinical predictors. Promoting Older Women’s Engagement in Recovery (POWER) is a collaborative project aimed at the prevention of opioid misuse in older women ages 55 or older in Cambridge and Somerville. The Institute for Health and Recovery received the grant and works alongside with Cambridge Health Alliance, Somerville Cambridge Elder Services, and the Cambridge Council on Aging to address the risk factors of opioid misuse among older women through technical assistance for partnership sites and direct support groups for women 55+. ICH is the evaluator on the project. If you or someone you know is struggling with addition, there are some resources available to help. The Massachusetts Substance Abuse Information and Education Helpline provides free and confidential information and referrals for alcohol and other drug abuse problems. The Institute for Health and Recovery helps families and youth with substance abuse issues access publicly funded services. The Suboxone Hotline Office Based Opioid Treatment Program at Boston Medical Center provides referrals and information on opiate and heroin treatments available at doctor’s offices statewide. Cambridge Health Alliance offers an outpatient addiction service which helps adults to and maintain sobriety. The Fresh Start Alcohol and Drug Recovery Group is an anonymous peer support group that meets on Thursday evenings at CHA Revere Care Center. Smart Recovery is a scientifically tested program for adults who want to manage their addiction and is held every Tuesday evening at CHA Everett Care Center.